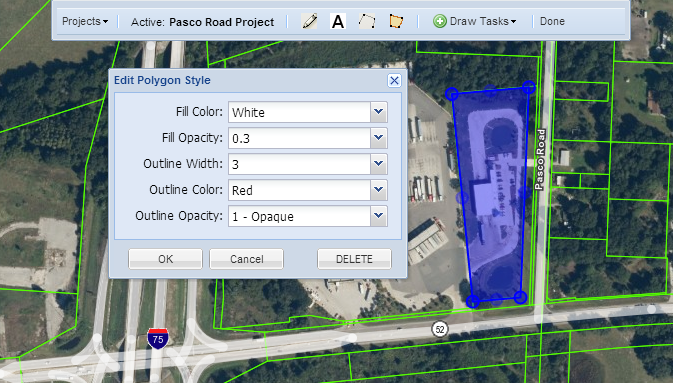 The drawing tools provide tools to add points, labels, lines and polygons to your map. Points, lines, labels and polygons are collectively called drawing features. You can style drawing features by changing their color, size and more. Point features can have store logos associated with them. Drawing features are organized into Drawing Projects. You can create hundreds of drawing projects if needed. Two folders are available to store drawing projects. The Personal folder stores projects only visible to you. The Group folder stores projects visible to anyone in your company. Projects are only visible to you or your company. 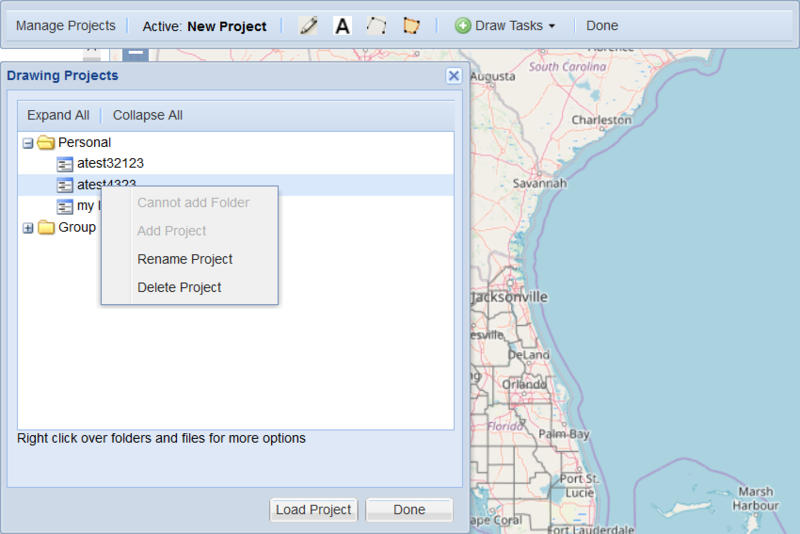 The drawing tools toolbar should now show the name of your new project as the Active project. You can now add features to the drawing project. The map will zoom to the map extent of the drawing features in the project. The drawing tool has two "draw modes". When it first starts, its in modify feature mode. 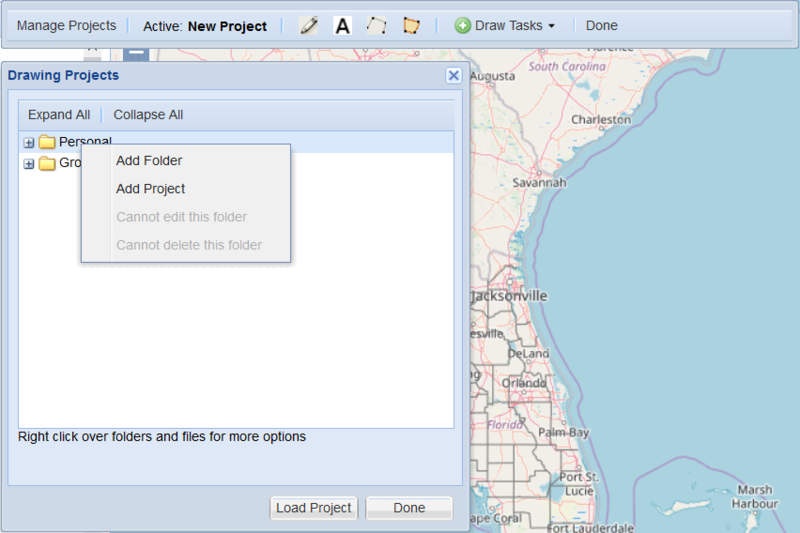 If you load a project with features, you can click on a feature to select it and a modify feature menu is shown. The feature can also be moved or reshaped. 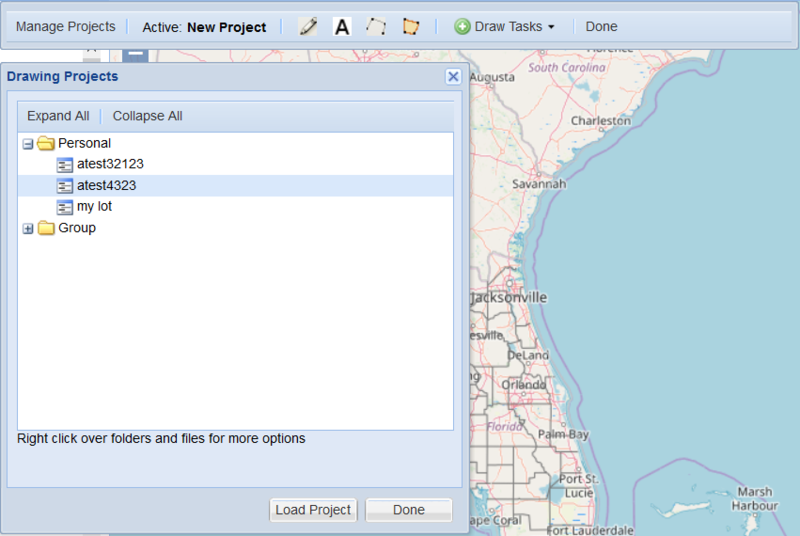 Select either the point, label, line, or polygon icon, then click in the map to add the feature. Click on the feature to modify. A dialog box will popup with additional options to change color, size, etc. Each drawing feature can be individually styled. Click on the feature to modify. To move a feature, click-drag. To reshape a line or polygon, click the feature and click on one of the handles. Click in the center of a line segment to add another vertice. Click on the feature to modify, then click the DELETE button in the edit style window to delete it. NOTE: The following video needs updating. The Manage Projects menus have changed.